Five Reasons I Went All-in with Dropbox - Ask Leo! I use Dropbox, OneDrive, Google Drive, and Amazon Web Service’s Simple Storage Service (S3) for online or “cloud” storage and backup. Each has their pros and cons, and each has their role in my setup. I was reviewing my costs recently. I noted that I have over a terabyte of photographs safely backed up to S3, and concluded that S3 is both inconvenient (it isn’t really “simple” to access) and possibly my most expensive option. Thanks to a recent change, I’ve settled on Dropbox as my most effective online storage solution. Dropbox works on all the platforms I use: Windows, Mac, Linux, and Android. Dropbox synchronization is robust and efficient. Dropbox includes file history, allowing me to recover accidentally deleted or corrupted files for up to 120 days (30 days in standard plans). Dropbox includes selective sync, meaning I don’t have to store all my Dropbox content on every one of my machines. Dropbox, while not the cheapest alternative, is the most cost effective for me. Most of my backups, and specifically my terabyte of photographs and videos, were on Amazon’s S3 online storage. It’s handy in that you only pay for what you use, and it’s exceptionally reliable. I continue to store several websites and support files, such as my podcast and self-hosted video files, there. But S3 isn’t really designed for the “average” computer user to use directly, as I do. As a Microsoft Office 365 user, I have access to at least a terabyte of Microsoft’s OneDrive storage; five, if I spread it across multiple accounts. Until now, I’ve used this extensively, particularly since OneDrive is so tightly embedded into Windows 10. 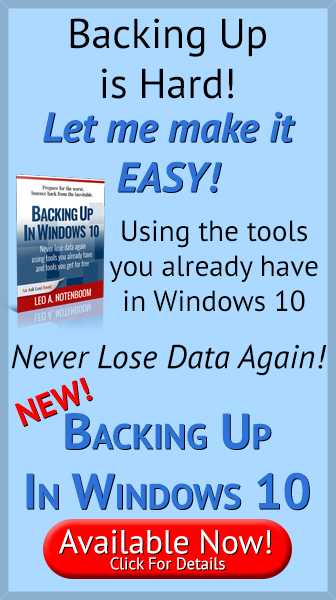 I had been storing all my (encrypted1) records, music, and other files of convenience for online and off-site backup. With the OneDrive app on my phone, I could access any of the files2, no matter where I was. I recently added Google Drive to my business’s online storage. I did this shortly after discovering that the server hosting my websites could back itself up directly to Google Drive, which was significantly less expensive than using the storage provided by my hosting provider. In addition, all my websites that had been backing up to Amazon S33 could back up to Google Drive as well. I also use Google Drive to share certain files — mostly Google Docs — with my staff and others. I’ve had Dropbox seemingly forever. Until now, it’s been a free account, starting at 2 gigabytes of storage, augmented by their referral plan up to a capacity of 22GB. Unfortunately, 22GB is not 1TB, and that’s what I need, if not more. Here’s why I made that decision. 1. Dropbox is everywhere I want to be. One of my ongoing frustrations with relying heavily on OneDrive is that while there’s a reliable client for Windows, Mac, and Android, there is no formal support for Linux. The Ask Leo! web server runs Linux, and one of my older desktop machines runs Linux Mint and acts as a backup repository. While there are third-party solutions to sync Linux to OneDrive, I was never able to get them to run reliably. Amazon S3 worked just about everywhere except my phone. Even then, it was primarily through command line programs or via integration into third-party file transfer (ftp) utilities. There’s no real automatic synchronization of files without those third-party tools, and my experience was that it was frustratingly slow to use them. Dropbox is installed and working on all the platforms I use. Synchronization is a feature in Dropbox, Google Drive, and One Drive. When a file is changed, added, or deleted in one place, that change is automatically made across all installations of the tool for that account. As I copy photos to a synchronized folder on my laptop, those files are automatically replicated to the cloud and to the other machines on which I have the same cloud storage tool installed. For me, Dropbox has proven to be the most reliable. If two of my machines running Dropbox are on the same local network — say two machines in my home — they transfer directly, without the slowdown or data usage of sending the data up and down my internet connection. Internet connections come and go, especially while traveling, and Dropbox appears to be very resilient. It transfers when it can, pauses when it can’t, and transparently resumes when the internet connection is available once again. I’m writing this while traveling, with a somewhat unstable internet connection.4 I’m relying on Dropbox to back up the photos I take on my trip, and it’s just quietly doing its job in the background without any fuss required. One of the major concerns about synchronized cloud storage is that if you corrupt or delete a file, that “change” will be automatically replicated across your storage, corrupting or deleting all copies of the file. While that sounds inconvenient, it becomes a much more serious concern if it’s ransomware encrypting all the files in your cloud storage folder. Dropbox Professional includes 120 days of file history. (Basic/Free and Plus plans include 30 days.) This makes it possible to recover files as they were before the corruption took place. OneDrive also includes file history from three to 30 days, depending on whether or not its Recycle Bin is full. Google Drive, from what I can see, doesn’t include file history. Given the concerns about data loss in light of malware and other threats, file history is a compelling feature. Just because I have over a terabyte in my Dropbox doesn’t mean I need a terabyte of space on every machine on which I have it installed. Heck, I don’t have a terabyte of space on every machine. This lets me easily pick and choose which portions of my cloud storage account I want replicated to any specific machine. OneDrive includes a similar feature. Google Drive and S3 do not. There’s (much) more to it all than simply the cost. I went for a slightly costlier option in Dropbox because of its stability and ubiquity. That being said, cost is one of the first things most people look at. (*) Approximate, based on annual payments and on my need for at least 2TB of space. Dropbox’s Professional plan includes 2 terabytes for around $200 per year. Google Drive (now “Google One”) is less expensive, at $100/year for two terabytes. It doesn’t appear to include file history, and requires third-party tools for Linux support. If you work primarily in the Google eco-system, though, and can compensate for the lack of Linux and history, it’s a pretty good deal. Microsoft’s OneDrive is complex to compare. A terabyte free with Microsoft Office is pretty compelling … if you have Microsoft Office. At $100 per year, though, it’s almost as cost effective to get Office just for the online storage, as long as a terabyte is enough. Much like Dropbox, it does include file history, though as I mentioned, Linux isn’t supported directly. That the OneDrive client is baked into Windows 10 also makes this a convenient solution if you work primarily in the Microsoft eco-system. Dropbox fills my needs quite nicely. It’s true I could cut costs even more by relying on OneDrive (I’d have to get or somehow manage additional space beyond that first free terabyte) or Google Drive. In either case, my ability to automatically and easily replicate to my Linux machines would come to an end. In just the few months since I’ve made the switch, it’s already proven itself useful. Particularly when I’m on the road, being able to access my saved reading materials, recent photos, and more via my phone has proven handy. That my photographs — which I copy from my camera to my laptop — are automatically backed up to the cloud and to my machines back home as I travel also adds a level of safety and security. For me, Dropbox seems the right choice. Why I’m (slowly) Switching to OneDrive - I'm slowly switching to OneDrive because I realized there was a fundamental difference between Google Docs and Microsoft Office Online. 2: Which also applies to the encrypted files, using BoxCryptor’s Android app. 3: WordPress sites, using Backup Buddy. 4: My VPN seems to occasionally disconnect for reasons unknown, so the internet connection is frequently disconnecting and reconnecting, with and without the VPN. Dropbox just plods right along. 5: Ironically, I do believe many of the other cloud storage providers use Amazon S3 as their back-end storage. Clearly they negotiated a better deal than I can. I can see how Dropbox is a more cost-effective option for many. However, I see this as a one size doesn’t fit all situation. OneDrive is my Cloud sync tool of choice. I used the $100 a year 1 TB option for a couple of years, and it was great, but when I saw that my $100 a year Office 365 subscription gave me from one to five TB storage, it was like paying for the storage and getting Office for free or vice versa. Dropbox has a few features I missed when switching to OneDrive. And when I switched, I was unable to use it on my Linux machine, so it all depends on what your needs are. I got around the Linux issue by using my 26 GB Basic Dropbox account for my most important files and syncing the rest: photos, music etc via OneDrive. Leo, collecting stuff is easy and with cheap storage there is always a place to keep them, but then what? 1 terabytes of stuff for one person? All that is good, but now you have to write an article about how you organize your stuff so that you can actually retrieve what you want fairly easily. That’s the real challenge. It seems that the next improvement for large storage repositories should be to offer a relational database structure or some indexing tools, otherwise millions of files with names such as DSCN100345 are pretty much useless. The problem is not trivial, even for huge companies, and is acutely demonstrated by what you find on the internet: you really don’t know the data source, the date of generation, sponsoring organizations, accuracy and veracity, completeness, etc. My photos are simply arranged by date. Folder per year, and then within each, a folder for each day on which I took photos. Agree that finding data is a problem, but it’s a complex one, and honestly it’s not a new problem. Leo’s comment about Smart Sync is interesting. I could see going with a 1T DropBox plan (aka “Plus”); at $100/year. But I see it doesn’t include Smart Sync. I’m wondering what that would do to my Android Phone, if I used over what it can handle? Could I have a folder in the cloud with files for just my phone? And if so, could I see same specific pictures, if I saved them in 2 places in the cloud side of DropBox? Dropbox for Android and iPhone, let you choose what not to sync with your phone. They are not automatically downloaded. You can download the files as you need them to your phone. Dropbox on a mobile deine doesn’t actually copy the data to your phone. It’s essentially a mobile optimized interface into the cloud/web interface. When you open a file in Dropbox on your phone only then is it actually copied to the phone. I can use onedrive via the web interface from my Linux system. Of course, nothing is automatic, I have to manually paste files to or from the cloud. Right, but that doesn’t serve my desire to have my Linux box be an automated backup of everything in my cloud storage. 1.) I use Windows 7 and locally installed Outlook 2010. All my email, contacts, calendar, tasks, etc. are stored locally in a .PST file. I don’t often reboot, and Outlook is running (thus the PST file is open) virtually 24 hours per day and is being updated almost every time an automatic send/receive executes, which is every 5 minutes. If I move my PST file to the Dropbox folder (and reconfigure Outlook to access it there), will it sync properly and reliably to the Dropbox server, and to my other devices (laptop and several other Windows desktops)? 2.) Are there certain types of data storage, like databases such as Quickbooks, or music files stored in iTunes, etc., which do not work well (or at all) with Dropbox? I would not place my PST file in a sync’d folder – dropbox or any others. Same for Quickbooks or large(ish) “database” files, especially those that are under constant access. Instead I’d copy them there periodically instead. In theory they should work, but I don’t know how frequently, or how reliably, they would be synchronized. Doesn’t Dropbox free also have Selective Sync? I don’t believe so. When you think about it, it makes sense, since the free plan is limited to 2GB by default (or 22GB if you do the referral thing enough). Selective sync really isn’t needed at those sizes. I use Dropbox to sync files between my Win7 Home Premium 64bit machine and my Kindle Fire HD8 (Android variant). It works — but not instantly. There is a delay of about 15 – 30 minutes (!) between placing a file into the Dropbox folder on one machine, and its appearance within the corresponding Dropbox folder on the other machine. Do you (or anyone else) know of any way to force-sync Dropbox? It depends on the platform. I don’t know of a way to force it on Android, for example, because it’s not really syncing “to” the android/kindle device: it’s just refreshing it’s view of what’s in the cloud. Often a refresh (drag down the page and release on my Android phone) will make that happen. And naturally it also is highly dependant on the size of the files and the speed of the internet connections involved. I would be curious to see how you would rate Amazon Drive/Photos which has been rapidly improving and now lets you select folders for real time backup for a reasonable price of $60.00 per year for a terabyte. https://www.amazon.com/gp/drive/about. I have been using it for a couple of years now but notice it never gets mentioned in backup comparisons though S3 often is. That actually is pretty good and I’d be happy to use it myself. (As a prime member I do have access to it I think). What I believe it lacks is a good sync agent on all the platforms we care about. I seem to recall that it wasn’t as easy to use as “general purpose” cloud storage, but really focussed on photos. Darrell, if you have Amazon Prime then you already have what you want for free. See my link above. Thanks for explaining why you chose Dropbox now (over OneDrive before). With the Black Friday deal, I’ve decided on pcloud (2 TB for $245) for my backups, and free Dropbox (8 GB) for my regular work. I have 5 GB of OneDrive, but not really using it. The reason is that I store things on my computer either in Evernote or folders in Dropbox. Once in awhile, I am accessing old stuff (e.g. old grad school and before) or large videos (daughter’s recital) that I’ve kept two Toshiba external harddrives. I’ve always been nervous the external hard drives may go bad, so I’ve kept them on OneDrive and Google Drive or in Dropbox. But then it is in a patchwork of places and I’m running low on Dropbox space. And low on my main computer hard disk space (30 GB Thinkpad from 2014). So I bought pcloud a few days ago and am moving at least one copy of everything there, where it stays OFF my hard disk, but is accessible. Frees up Dropbox to do more. Also, I’m taking all the webinars I had saved in Evernote and moving those to pcloud, which will reduce Evernote size too. I will move all backup all my Google photos and Music to pcloud maybe over the holidays (all on external hard drive, bigger than my current hard drive, so will take a long time). I disagree on this one Leo. There are many of us who use these services as collaboration and publishing tools also. We need to link audio, video, and all types of data to other websites,blogs, and platforms, etc.. In the past 18 months Dropbox has made major ‘policy’ changes which resulted in many user’s links invalidated and made obsolete without warning. They changed their sharing policy without warning and left many of us with thousands of dead links with no way to repair them. Recently they mad another ‘silent’ policy change and limited or removed the ‘preview’ facility when processing links from Dropbox….again without warning. Although I do agree Dropbox makes for a good Cloud storage utility there is more to using these services than just the static cloud data storage utility and Dropbox has fallen short on shared links and their collaboration tools and policies…..I learned this the very heard hard way. Years ago, I kept a copy of my website on Dropbox, simply as a backup. I was surprised to see that it functioned perfect well directly from Dropbox. From your comment, it appears that it won’t work like that anymore. It sounds like Dropbox doesn’t want itself used that way as it uses a lot of bandwidth.